PECS is a picture exchange communication system whereby the child learns to use pictures in order to initiate communication. Developed within the Delaware Autistic Programme over ten years ago, it is widely used throughout the world. Two adults are needed in order to initiate PECS. 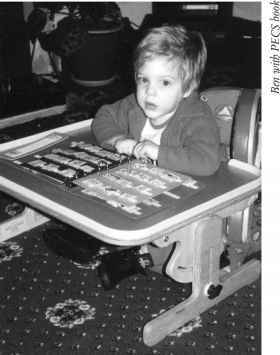 Motivators are used such as a dummy, food or favourite toy (Ben was not on the GF/CF diet then so toast was a great motivator for him). The motivator is shown to the child by one adult and when the child reaches for it, the other adult assists the child in picking up and handing over the symbol card. Lots of praise is given when the child hands over the card but no verbal prompts are to be used. As the child becomes more adept at exchanging a picture symbol for a motivator, more cards are added to the repertoire and eventually other cards such as 'I want' and 'please' are added. The child eventually goes on to use a sentence strip in order to make multiple requests. For us as a family, PECS worked wonders and changed our lives. After an assessment with a speech and language therapist at the Child Development Centre, it was suggested that Ben may be able to use pictures as a means of communication. Our Portage worker (thank you Julie!) soon began the PECS training programme and to cut a long story short, Ben changed from being a head banging, frustrated little boy, to a far happier little chap who could easily pass me a sentence strip telling me that he wanted to go out to McDonald's and eat French fries, cheeseburger and a milkshake! Whilst the initial stage was very difficult and consistency is of utmost importance, the system needing to be used in all places and by everyone, for us it was a precursor to speech and alleviated frustration for all.